The first photo is of a red bricked house, which was the home of Maria and Elizabeth Branwell. Maria Branwell was mother to Charlotte, Emily, Anne and Branwell Bronte. 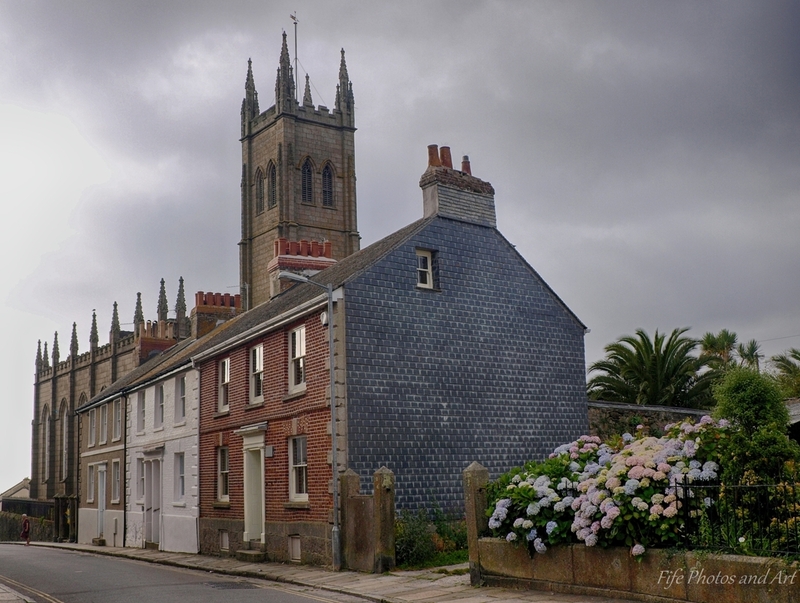 The house is located towards the bottom of Penzance’s historic Chapel Street. The Bronte sisters were famous, as I sure most people know, for writing books such as Jane Eyre and Wuthering Heights and have always been strongly associated with Yorkshire. However, their mother, Maria, was from a very prominent Penzance family. Maria Branwell left Penzance, for Yorkshire, where she got married in 1812. Sadly for her and her family, she died a few years later, but her sister, Elizabeth, then also moved from Penzance to look after the children. The house itself is unusual for Penzance, in that it is built of brick. It is part of a short terrace referred to as the Rotterdam Buildings. As the story goes, the bricks were confiscated from a Dutch cargo ship out in the bay, by local buccaneers. The church in the background of this photograph is St Mary’s Church, which was designed by Charles Hutchens of St Buryan and built between 1833 & 1835. This entry was posted in Architecture, Fine Art Photography, History and tagged churches, Cornwall, Penzance. Bookmark the permalink. The history that you narrate always adds to the feeling of the photograph – it’s not just a stark architectural beauty. There’s a warmth knowing a little bit about the family who resided there. That’s a very lovely terrace. I didn’t know the origins of the Brontes’ mother so interesting too. And I think most people are surprised too, about the Brontes’ origin being Penzance. Lovely photo. I’m envious of the gorgeous hydrangeas. And thanks for the history lesson. Lori is right; this adds so much to the photo. Lovely pic, Andy! If I hadn’t read your intro, I would never have thought that was Penzance. I didn’t know about the Bronte connection, either! Very interesting. I think the thing that makes it is the reflection in the top windows, as if the house is ‘seeing’ or remembering something that we can’t see. Thanks Jo 🙂 Most people, even in Penzance, don’t see the plaque on the wall of the house which shows the Bronte connection!